The importance of estimating compressional wave properties in saturated marine sediments is well known in geophysics and underwater acoustics. As part of the ONR sponsored Geoclutter program, in situ acoustic measurements were obtained using ISSAP (In situ Sound Speed and Attenuation Probe), a device developed and built by the Center for Coastal and Ocean Mapping (CCOM). The location of the Geoclutter field area is the mid-outer continental shelf off New Jersey. Over 30 gigabytes of seawater and surficial sediment data was collected at 99 station locations selected to represent a range of seafloor backscatter types. At each station, the ISSAP device recorded waveform data across five acoustic paths with nominal probe spacing of 20 or 30 cm. The transmit/receive probes were arranged in a square pattern and operated at a nominal frequency of 65 kHz. The recorded waveforms were processed for sound speed using two methods, cross-correlation and envelope detection, and compared. The waveforms were also processed for sediment attenuation using the filter-correlation method. 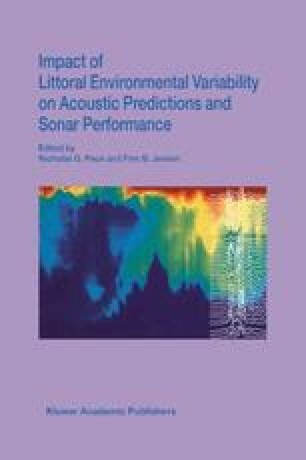 Results show considerable variability in the acoustic properties at the same and nearby seafloor locations.